Hello everyone!!!! First and foremost I just want to remind you all that there is ONE MORE DAY to enter to win fun prizes from our 3rd bloggy birthday we had last week! So if you haven't entered to win, make sure you do so now :) It closes tonight! So, my husband's birthday was yesterday. His 32nd birthday to be exact. Goodness gracious that blows my mind. I remember walking into a little tiny family Christian bookstore trying to find something "memorable" and "inspirational" for his 20th. Oh life...slow down a tad would ya? Honestly though, I love when his birthday rolls around. Actually, I just love celebrating birthdays in general! His is extra special though ;) He's the one my heart goes silly for- which means that's definitely a life to cherish and celebrate! And a celebration we had! He was loved and loved and loved on- such a great weekend. I honestly can't think of a better way to spend the weekend than joining with family, food all around, celebrating someone's life. There's just something so refreshing and calming about heading over to a family member's house, with food in hand, about to join in on a night or afternoon of gathering of some sort. Amiright? And being summer time??? Goodness! It's warmer, nights last longer, the air smells sweeter...I mean, I could live in a summer night's dusk forever and ever. 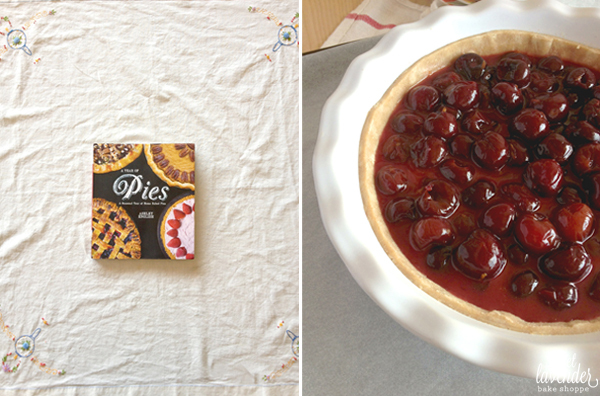 Which reminds me- I never got around to sharing this cherry pie with you guys, from a family gathering a few weeks ago. I apologize for that. This pie was inspired by a few different things. For one, it was for my dad for Father's Day. He LOVES pie and even more than that, LOVES cherry pie! Secondly, it is indeed summer time, which means sweet cherries are in season! Wheeeeee! Gotta love a perfectly ripe, sorta crunchy, sweet black cherry! Lastly, a very very sweet and dear friend of mine (you know who you are, lovely girl) sent me the nicest little present in the mail a few months ago- a cookbook that I had actually been eyeballing for some time at our local Williams Sonoma! A Year of Pies by Ashley English! Great minds certainly think alike! She couldn't have known I was wishing for this book! The timing was perfect! I was having a day of discouragement over my friend Stephanie and her battle with cancer, so upon opening up, I cried, laughed, and then immediately dog-eared about 50 pages of pies I "just had to make"! 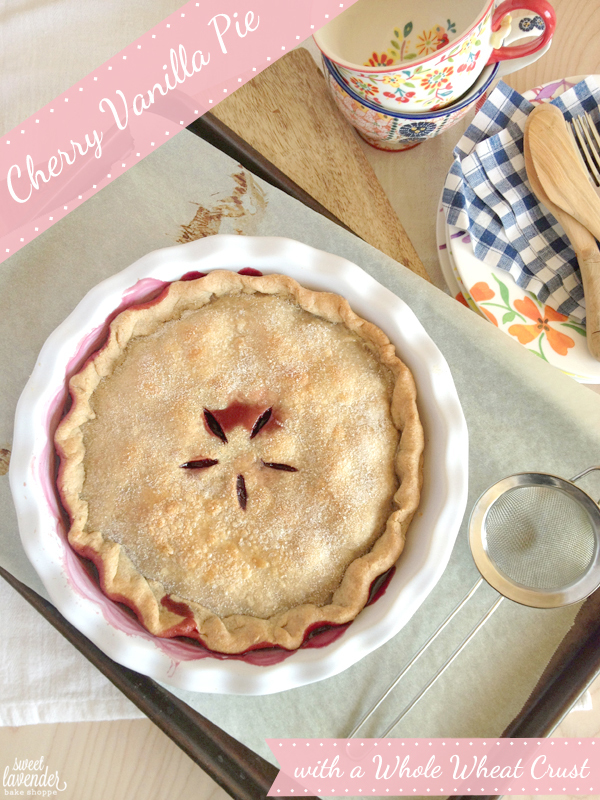 One of the recipes was Ashley's "Cherry and Vanilla Pot Pie". I mean, yum, right?!?!? It was like that recipe was screaming at me to make. And so I obliged and did what any good baker would do- made that darn pie. If you're a long time reader of my blog, you know that whenever I make something for my dad, I have to watch the sugar as well as the white starch. So every year, for his birthday or Father's Day, I end up trying to recreate a favorite dessert of his, with either WAY less sugar, a healthy sugar alternative, OR no sugar at all (using maybe the fruit's natural sugar instead) AND a dessert that includes as little white flour as I can. Challenging? Yes ma'am. Worth it? Totally. This year, this pie- no exception. I also opted to buy frozen black cherries because they were on sale at our little health food store! Have fresh? Use em! The original recipe calls for 3# fresh pitted cherries with 3 tablespoons cornstarch added :) My cherries were left unchopped. With the addition of vanilla and orange zest, this pie takes on a deep warm flavor. Don't worry though- neither ingredient masks the star of the show! 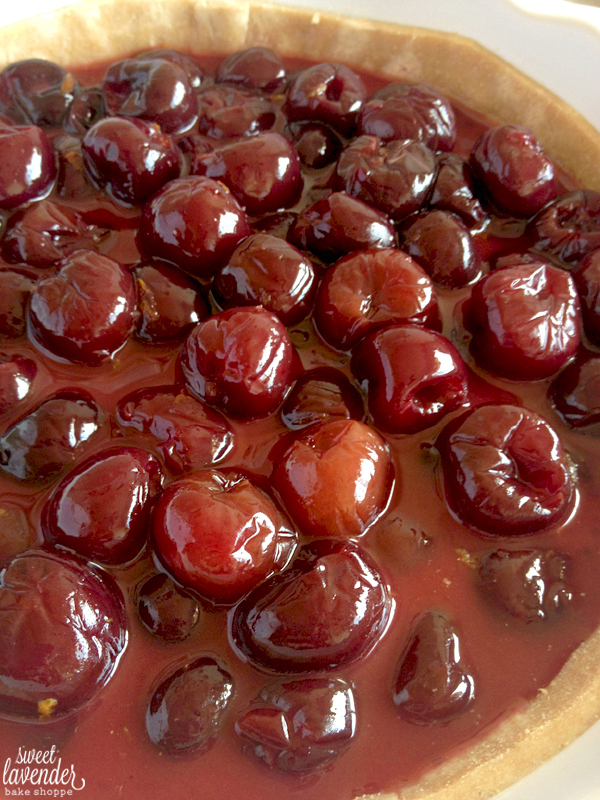 The cherries certainly pop through in each bite, bursting with their yummy cherry juices. The filling begins to bubble out of the pie during baking (mmMmMmm) and then gels a bit after sitting room temperature. Adding whole milk and a sprinkling of vanilla sugar onto the top crust helps in an even browning and a crispy sweet bite. Father's Day was delicious to say the least. The steps for this crust are exactly the same as my basic pie crust. So if you'd like a more thorough and step by step insight, that would be a great place to visit. 1. In a bowl of an electric mixer fitted with a paddle attachment, add your spooned and leveled flours (both AP and whole wheat), salt, and sugar. 2. With your mixer on medium to medium-low, add your COLD cubed butter, one square at a time. When all the butter has been added you'll want to see a sand-like texture with a few lumps of butter the size of peas. 3. Turn your mixer down to low and SLOWLY add your ice water (omitting ice!!) little by little until the dough JUST comes together and starts to pull away from the bowl (DO NOT OVERMIX WHAT SO EVER). Depending on where you live and the weather the day you do this, your water amount will change- so you might need 1/4 cup, might need closer to 1/3. Just add a little at a time until dough JUST comes together. As soon as it does this, STOP mixing! You can easily over mix- which will result in a less flaky crust. 6. Gently press dough into pan, making sure to get into the bottom well. Then with a sharp knife, cut the excess dough off as you go around your dish. SAVE THESE SCRAPS! Bring scraps back together, re-wrap with plastic and place in fridge. You'll be using them to top your pie, tomorrow! 7. As for your pie, wrap well with plastic wrap and allow to sit in fridge, overnight to settle. As you can see, allowing your crust to rest overnight in the fridge encourages the butter to solidify and get ready for baking (and creating a flaky crust)! 1. Preheat oven to 375°F. Line a baking sheet with tin foil and set aside. 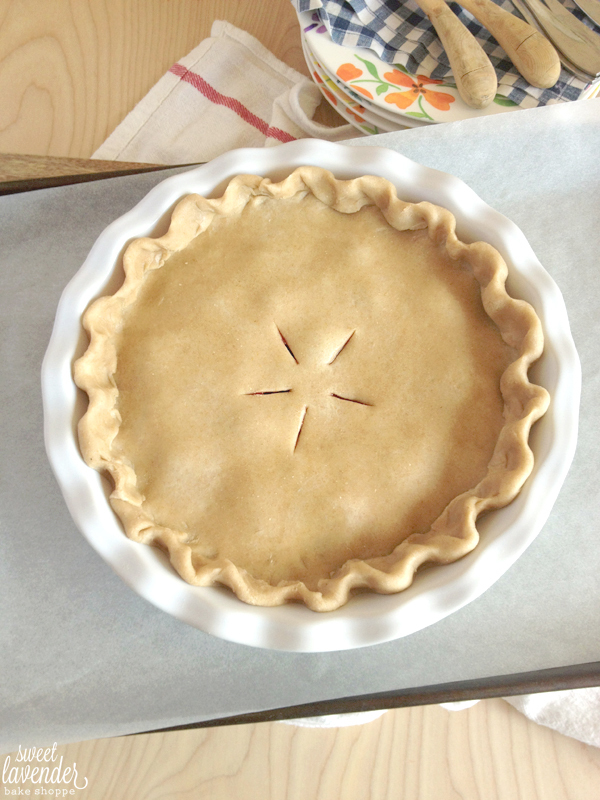 Remove extra pie dough from fridge and allow to come to room temperature a bit, for easier rolling. Once dough scrap disk has softened a tad, roll out on a floured surface according to how you'll cover your pie: a circle as wide as your pie pan, for full coverage or cut into lattice strips for a latticed top. Set aside. 2. In a bowl, combine completely defrosted bags of cherries (with their juices as well), the seeds of a scraped out 1/2 vanilla bean, cornstarch, vanilla sugar, salt and orange zest. Mix well, being careful not to break up cherries. 3. 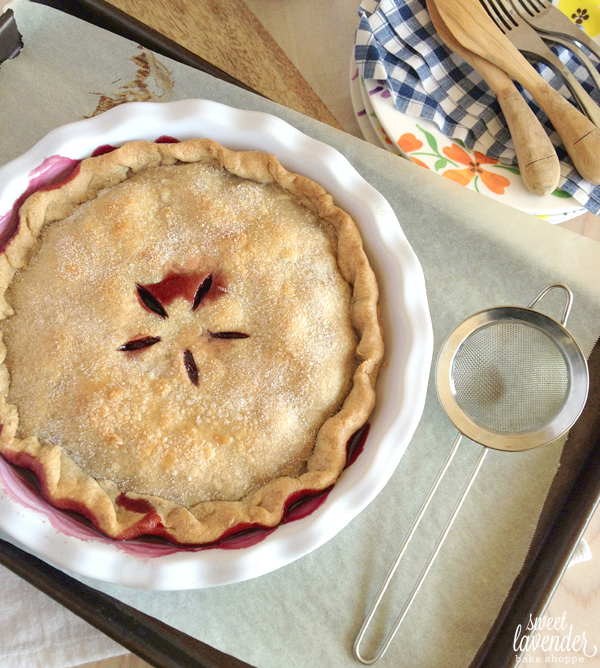 Take prepared pie dough in pie pan out of fridge and place on your cookie sheet. Pour cherry mix into your pie dish. Cover your pie with your rolled out dough. I choose to do a fully covered top, because I felt it looked comforting and homey. If you decide to do a fully covered top as well, make sure you seal your bottom crust to your top crust by pinching seams together AND cut air vents into your top crust to allow steam to exit! 4. Place prepared pie, on sheet pan, in middle rack of oven and bake 25 minutes. Make sure to turn pan half way through cooking for even browning. 5. 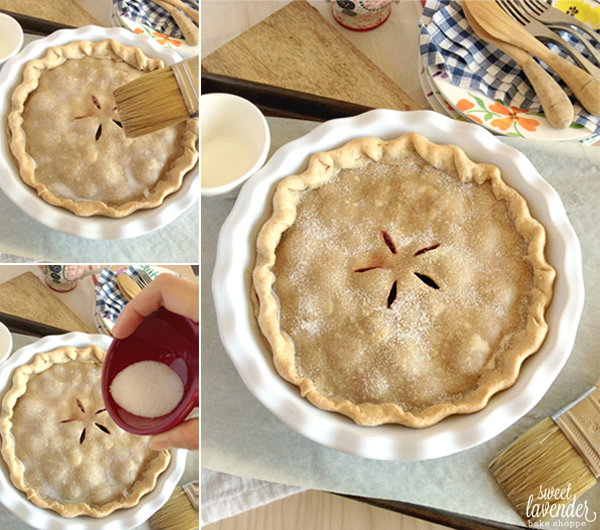 Remove pie from oven and quickly brush with your tablespoon of whole milk. Heavy cream and half & half will also work here. Then sprinkle top with your 1 1/2 teaspoons of vanilla sugar. Place pie back into the oven (on your sheet pan still) and bake an additional 25 minutes or until pie filling is bubbling and your crust is a nice golden brown. Turn pie half way through baking time, again. If the edges of your pie are browning too quickly, remove pie from oven, and make sure to lightly cover (just the sides) with tin foil to slow down the browning process. This pie would be amazing served slightly warm with a hefty scoop of homemade vanilla bean ice cream or homemade whipped cream on top! My husband would rather have a pie to celebrate than cake any day. I'm going to hafta safe this for future reference!! I might have to agree with your husband, here! You always make the most gorgeous pies! Beautiful pie my friend! 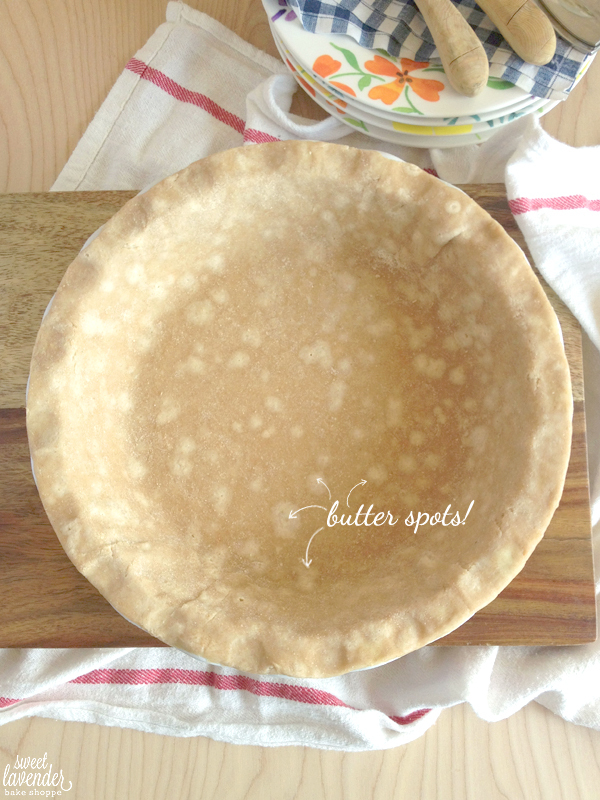 I like the idea of a whole wheat crust... must try!